"Our excellent sales in the third quarter underscore the relevance of our strategy and the effectiveness of its execution. In a complex environment, we stepped up the pace of revenue growth and continued to gain market share. Thanks to the creativity of our brands and the outstanding customer experience they offer, we achieved double-digit increases across all geographic regions excluding Japan. Gucci and Yves Saint Laurent performed remarkably well, while Puma confirmed its solid growth trajectory. We have laid the foundations for steady, sustainable growth, and are highly confident about the full year." • Third-quarter 2016 revenue of €3,185 million, up 10.5% on a comparable Group structure and exchange rate basis, up 10% as reported. • Sharp acceleration in growth. Double-digit comparable revenue growth across all geographic regions apart from Japan. • Revenue up 11.3% on a comparable basis (up 12% as reported). • Remarkable growth at Gucci (up 17%) and Yves Saint Laurent (up 33.9%), both of which continued to gain market share. • Revenue up 9.3% on a comparable basis (up 6.5% as reported). • Sustained double-digit growth at Puma (up 10.8%), driven by the success of its offering. Luxury activities generated €2,115 million in revenue during the period, up 11.3% on a comparable basis and 12% as reported, marking the fastest quarterly growth rate in comparable sales in the past three years. Aside from the remarkable performance by Gucci and Yves Saint Laurent, revenue growth for the other brands was in line with second-quarter trends. Sales in directly operated stores enjoyed double-digit growth across all geographic regions excluding Japan, with strong growth of 24% in Asia-Pacific, a very steady 17% increase in revenue in North America and an extremely good performance in Western Europe, which expanded by 12%. Gucci gained further momentum in the third quarter, significantly outperforming the sector with a 17% increase in revenue on a comparable basis (up 17.8% as reported). Sales were up sharply across all product categories and regions, excluding Japan, where market conditions were lacklustre for the sector as a whole. Gucci sales in directly operated stores rose by a very strong 19% based on comparable data. Both men's and women's Shoes and Ready-to-Wear enjoyed considerable success, as did Leather Goods, where GG Marmont, Sylvie and Dionysus, for example, confirmed their status as the stars of the handbag offering. Alessandro Michele's latest show, one of the most eagerly anticipated events of the Milan Fashion Week, received an enthusiastic response, again confirming the success of the brand's creative reinvention. Gucci collections continued to meet the approval of its clientele while attracting an increasing number of new customers. The brand has a particularly innovative digital strategy, which included in the quarter acclaimed partnerships with artists (GucciGhost product line and the #24HourAce initiative) and capsule collections sold exclusively online (Gucci Garden). Sales from Gucci's e-commerce website increased by more than 50% during the quarter. Third-quarter sales at Bottega Veneta were again impacted by slower tourism, particularly in the mature markets of Western Europe and Japan. Revenue was down 10.9% on a comparable basis and 9.3% as reported. While sales in directly operated stores were lower in the quarter, they delivered a slight improvement compared to the second-quarter trend thanks to resilient sales to local customers in Europe and growth across all main markets in Asia Pacific, with the exception of Hong Kong. The Maison is pushing ahead with the implementation of its action plan, which notably involves renewing the Leather Goods offering and improving the in-store visibility of all new products. Under this initiative, Bottega Veneta introduced new models based on intrecciato, a leatherwork technique that is emblematic of the Maison's craftsmanship. The brand also continued to develop its Shoes category, which confirmed its momentum in the third quarter. The universally acclaimed Spring/Summer 2017 anniversary collection showcased the unique heritage and strong foundations that will ensure Bottega Veneta's future growth. Yves Saint Laurent continued to enjoy extremely strong growth in the third quarter, with revenue rising by an exceptional 33.9% on a comparable basis and 34% as reported. This latest increase in sales was achieved across all geographic regions and product categories, including men's and women's Ready-to-Wear as well as Shoes and Leather Goods. New collections including handbag models such as the Sunset Monogramme continue to be met with great excitement by the clientele, while permanent collections remain enduringly popular. This enthusiasm can be witnessed both in the brand's stores and on its e-commerce website, revenue from which nearly doubled in the third quarter. The first collection of Anthony Vaccarello for Saint Laurent was shown on 27 September at the Maison's future headquarters on rue de Bellechasse on Paris's left bank, to great acclaim. Third-quarter sales at the Group’s Other Luxury brands were up 2.5% on a comparable basis, or up 2.4% as reported. As with Luxury activities as a whole, sales in directly operated stores rose steadily across all geographic regions excluding Japan, growing by 7% on a comparable basis. Sales by Couture & Leather Goods brands continued to climb, with Balenciaga, Stella McCartney and Alexander McQueen each posting growth of around 10% or more. Brioni built promising sales momentum in directly operated stores, particularly in North America, but was held back by its wholesale business. The Maison is moving ahead with initiatives to strengthen its market positioning. In the Jewelry segment, Boucheron and Pomellato demonstrated their vitality, each generating double digit growth during the quarter. Boucheron performed well in both Jewelry and High Jewelry thanks to new creative initiatives, such as the 26 Vendôme High Jewelry collection unveiled during Paris Haute Couture Week in July. While still feeling the effects of a difficult market, brands in the Watches segment continued to adapt their offering and communications. Puma grew by 10.8% on a comparable basis and was up 8.3% as reported during the third quarter, building on its innovative products and renewed appeal. The Shoes category performed particularly well, posting 17% growth, fuelled by the success of new models such as Ignite, Fierce and Fenty. Revenue from the Apparel category was up a solid 10%. With the exception of Japan, Puma achieved double-digit growth across all geographic regions, enjoying strong performances in Europe and the Americas, and sustained expansion in Mainland China. Volcom continued to be impacted by the challenges facing action sports retailers in the US. On 20 September, 2016, the Arborus Fund, the leading provider of funding support for gender equality in the workplace in Europe and worldwide, and Bureau Veritas awarded Kering the Gender Equality European & International Standard (GEEIS) label, in recognition of the Group's actions to promote equality between women and men in the workplace. On 26 September, 2016, Kering was recognised as one of the top 25 most diverse and inclusive publicly listed companies globally, according to the Thomson Reuters Diversity & Inclusion (D&I) Index. Kering was the highest ranking luxury company to be included in the top 25, placing 22nd out of 4,255 publicly traded companies. On 29 September, 2016, Kering announced the appointment of Claus-Dietrich Lahrs as CEO of Bottega Veneta, effective October 4, 2016. He reports directly to François-Henri Pinault and is a member of the Group's Executive Committee. On 29 September, 2016, Kering also announced the appointment of Carlo Alberto Beretta to the newly created position of Chief Client & Marketing Officer, effective October 4, 2016. He reports directly to François-Henri Pinault and remains a member of Kering's Executive Committee. On 5 October, 2016, Gucci confirmed its status as the world's most valuable Italian brand, across all industries, when it was named the country's leading representative on Interbrand's 2016 Best Global Brands ranking for the 17th consecutive year. On 11 October, 2016, Nikolas Talonpoika was appointed CEO of Christopher Kane. He reports to Jean-François Palus, Kering Group Managing Director. On 24 October, 2016, Kering announced the appointment of Cédric Charbit as CEO of the Maison Balenciaga, effective 28 November 2016. He will report directly to François-Henri Pinault. The Group generated revenues of more than €11.5 billion in 2015 and had more than 38,000 employees at year end. 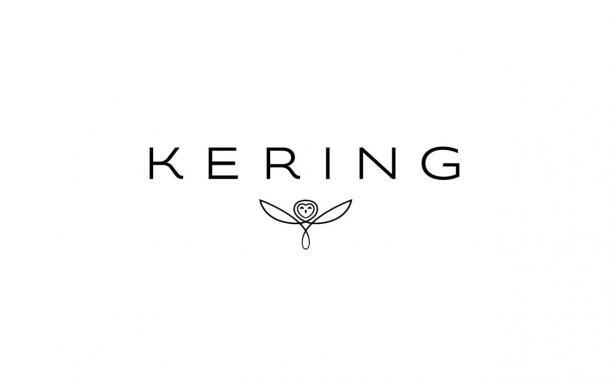 The Kering share is listed on Euronext Paris (FR 0000121485, KER.PA, KER.FP).